If you are browsing the Internet looking to buy your first electronic cigarette starter kit then I’m sure you’ve run across White Cloud ecigs a few times. The brand has been on the market for the last six years but not long ago their starter kits, even though impressive when it comes to quality, were some of the most expensive ecigs on the market that few people could afford. But nowadays things changed, and White Cloud Cigarettes became one of the most popular brands mostly due to the fact that their products are still considered by many to be the ‘Rolls Royce’ of the ecig business, where quality is above everything. White Cloud specializes in the production of cig-a-like devices and they produce some of the best. They have a wide variety of starter kits, built for every taste and pocket, a wide range of flavors and they even sell disposables. They don’t offer any e-liquid but their cartridges are impressive when it comes to aromas, performance and price. If you never tried an ecigarette, then White Cloud might be just the brand you’re looking for when making the switch from analogs. The first impression you get when you hold the starter kit in your hand is of high quality; everything is top-notch from the printing to the material choices. Since White Cloud is obviously taking its cues from Apple, the Cirrus packaging is very sleek and smart. The design of the ecigarettes is really impressive; they fit perfectly in your hand and the materials used give a very good vibe. They are white by default (you do have the option of chancing the color and the tip with some of the starter kits) with the logo perfectly visible and the accessories are eye-candy. 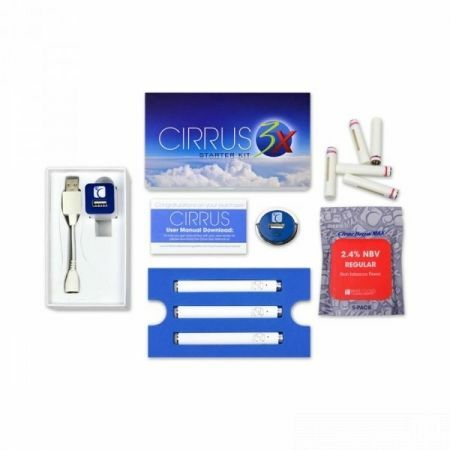 The Cirrus 3X Electronic Cigarette Starter Kit is available for $89.95 and it comes with a 30 day guarantee. You also get two years commercial warranty included with your purchase. You can read about terms and conditions on their website. We decided to review the Cirrus 3X instead of the cheaper starter kits mostly due to their batteries. The market is already saturated with a lot of brands selling cig-a-likes with similar performance, therefore this kit is like a breath of fresh air. With a charge time of 120 minutes, the C3X can churn out more than 600 puffs on a single charge and is still only 4.25 inches (11cm) in length with the cartridge attached. Also the C3X batteries are compatible with all SmoothDraw cartridges, ClearDraw cartridges, and White Cloud accessories. These batteries are based on a lithium polymer design which allows for a full 8 or 9 second draw which no other brand can claim. All Cirrus batteries are available in classic white or brushed metal finish with gray, black, or crystal ash tip. Grey and crystal tips glow with a realistic orange LED. The black tip blocks the glow of the LED, providing you with a more discreet vaping experience. Vapor production is impressive and the throat hit is one of the best you will ever find with an electronic cigarette. We found the ‘Extra’ (3.6% nicotine) to be the perfect balance between vapor production, throat hit, nicotine level and flavor but there are plenty of other options if you’re not completely satisfied. When it comes to flavors, White Cloud wanted to suit all needs and came out with one of the widest variety of cartridges in what cig-a-likes are concerned. There are the tobacco flavors: Lime and Coconut, the Menthol, Apache, Espresso, Snap and Zero K, Peach Pit, Kick, Iced Berry, Atlantic Cut, Regular, Chocolate, Strawberry, and Clove. All of these aromas come in 6 available nicotine levels: Double Extra (54mg), Extra (36mg), Full (24mg), Light (16mg), Ultra Light (8mg), and Nicotine-free (0mg). It is the only brand we reviewed so far to offer the 54mg ‘Double Extra’ nicotine concentration for those over a pack a day ex-smokers. White Cloud offers incredible performance and an impressive array of flavors and nicotine levels. Their devices are responsive, they produce good amount of vapor and the throat hit is phenomenal. And while the Cirrus 3X may not be the most expensive starter kit on the market, it is definitely worth every penny. Those batteries are a technological breakthrough and they are going to give even the most avid vaper a lot of autonomy.